I have elder berries in my freezer. Do you have recipes how to make n use them? Hi! I was wondering, can you eat berries themselves? I picked a lot and froze this summer so instead of making a syrup, can I just eat them raw? need to post recipe on how to make syrup. I have 2 gallons of juice. Do I just cook it some more till it reduces and get syrupy? And do I add sugar or honey to make it palatable? nice research but the headline suggests the information is new. Clearly these aren’t new studies. Hello, does elderberry have any affects while taking warfarin (Coumadin)? Do you take elderberry when cold or flu symptoms appear? Dosage: 15ml 4 times a day. Is this the dosage for children(what age) adults/elderly? Do they all take the same dosage? Is the syrup full strength or diluted. Is the syrup packaged or do you pick the berries and make the syrup? Hello. Thank you for this summary information. Did the articles specify how the elderberry syrup/extract was prepared? If so can you please share them (i.e., for the 2004, 2009 and 2016). What about Elderberry wine??? Home Brew?? 1 cup dried elder berries to two cups water, simmer on the stove for an hour, smushing berries as you stir. Strain, mix in 1 cup of honey, and pour into jars. It can be frozen but it keeps in the fridge for months! This is the recipe I use, super easy. Donde se consigue en Puerto Rico ? was there a reason you chose not to cite properly the studies you reference? I believe links to the studies are embedded in the article. There are hyperlinks to the studies provided. The links include the studies and the citation appears proper. I’d like to see citations also! Although I followed the 3 hyperlinks and tattoo are from the the NIH and one is in a pharmacy journal. So seems legit. Remove from heat and let cool until it is cool enough to be handled. When it is no longer hot, add the honey and stir well. How much should one take daily? i make it with organic dried elderberries, cinnamon, cloves, ginger and honey! Self-reporting of “flu-like” symptoms is not the same as actual flu diagnosis. This article is blatantly lying. 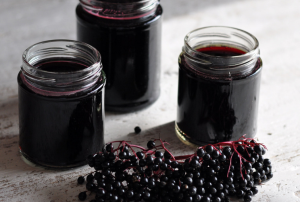 I gather elderberries in late summer every year and tincture them in Vodka with a bit of Echinacea root. Just remove the berries from the stem and put into a glass jar with the Echinacea. Barely cover with Vodka (or any alcohol 80 proof or higher) and steep for about 8 days. Shake every day as the mixture steeps, just to distribute he alcohol and berries. Strain and bottle. Keep in a cool, dark place (does not need refrigeration). When you get the flu or a bad cold take 1 tsp. every 2 hours in hot water or hot herbal tea. If you need to avoid alcohol you can tincture in vinegar. The alcohol tincture keeps about 5 years.